Even if you have never been to Delray Beach, you will undoubted find everything extremely appealing about Cucina Fra Diavolo. The upscale ambiance with its touches of blue, beige and brown, elegant contemporary prints and glittering ceramic tables provide a stirring setting for refined Italian cuisine crafted by Chef/Proprietor Gabriel Geller. Often restaurants schedule their early bids at some untimely hour (when most are still at work). Of course, snowbirds, golfers and yachtsmen can enjoy dinner at any hour, but fortunately, for the rest of us, Cucina serves complete early birds all night, seven days a week from 4 pm until close. All dinners begin with a choice of soup or salad. The soothing, savory broth of the Minestrone soup harbors a medley of fresh vegetables. A bountiful Caesar or House Salad is your other option. There is an incredible number of mains from which to chose – almost three dozen – clustered in four groups. Each entree bears the master’s touch and contains only prime, fresh ingredients served in abundance, From the first set, all priced at ($12.95), we selected the sizable platter of delectable Eggplant Parmigiana topped with a flow of mozzarella and partnered with ziti. 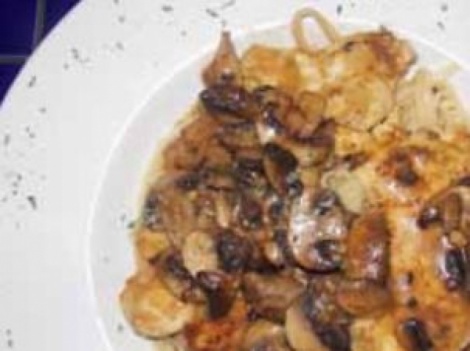 In the second tier ($13.95), the Chicken Marsala proved irresistible with its fragrant brown sauce and plump mushrooms bathing each cutlet and infusing the supporting layers of linguini. As tempting as the third group ($14.95) appeared with its range of signature veal entrees, we decide to be a bit more adventurous and opt for a fra diavolo dish in the last grouping ($15.95). After all, how best to make the most of your visit to Cucina Fra Diavolo than by savoring a specialty which shares the restaurant’s surname. Seafood aficionados will appreciate the Shrimp Fra Diavolo with its bounty of succulent crustaceans set in a delightful perky, but not overly torrid red sauce and spread over al dente spaghetti. In the same section, Snapper Livernaise featuring gently sautéed filets immersed in a superlative mild red sauce seasoned with calamata olives, capers and accompanied by a medley of fresh vegetables.